I played the clarinet for a few years in school, though I’m not really sure why. I was never really all that interested in it and I rarely practiced. It was pretty fun for a while though. 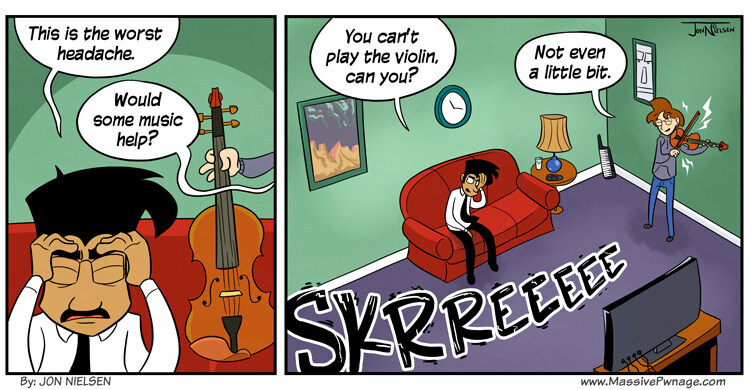 Never touched a violin. This entry was posted on Monday, January 16th, 2012 at 12:00 am and is filed under Comics. You can follow any responses to this entry through the RSS 2.0 feed. Both comments and pings are currently closed. ive played the violin, but i like the base guitar better, because atleast then your music is not mistaken for a cat dying an excruciatingly painful death. lol I see the keyboard in the corner!